After such a good day yesterday I wondered if today could match it. We all agreed that we would meet up in the hostel reception before going somewhere else for breakfast. Myself and Marion were there on time but no Ceylan. Neither of us could remember her room number so Marion asked reception and to my amazement they gave it to her. Ceylan was still asleep but said she would meet us over the road. It is good to have something else to eat for breakfast than cereal and cold meat. The ham and eggs tasted good. Ceylan came over and we sat and planned our day ahead. We were going to meet up with others from the walking tour at the Central Market Hall. The weather felt colder today but was still acceptable. Yet again I was offered a chance to purchase a Iphone. Again I declined but I had heard that somebody had their phone stolen at the Szimpla Bar last night. We met up with Bree and Martin. It was a good opportunity to buy some souvenirs. The prices seemed cheaper in here and I ended up buying some paprika. Downstairs was home to the food section. Ceylan and Marion suggested that we purchased some food to have for a picnic later. I agreed that it was a good idea. Upstairs was where you could purchase other souvenirs. More importantly there were cafes and bars. These were where the locals would meet up. One piece of travel advice I always take is eat where the locals eat. There was a wide range of food available to eat. 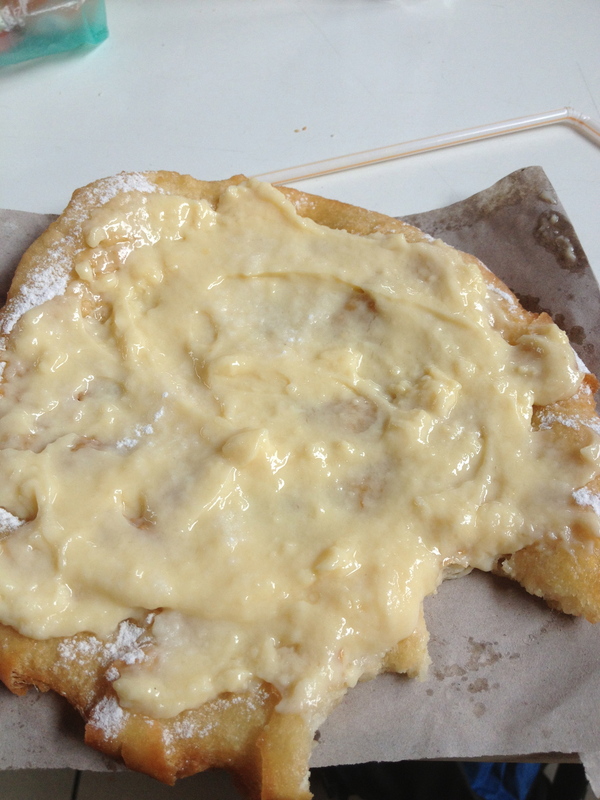 I chose to eat a langos. It is sort of pizza base that can be eaten sweet or savoury. Indulging my sweet tooth I chose to have mine with vanilla. It was really filling and delicious. We had to say goodbye to Bree who was leaving today. Martin had also disappeared by then. The rest of us agreed that we should aim for the Opera House. The weather was improving so the walk was good. We reached the Opera House but while we could go inside there were no tours until further in the afternoon. 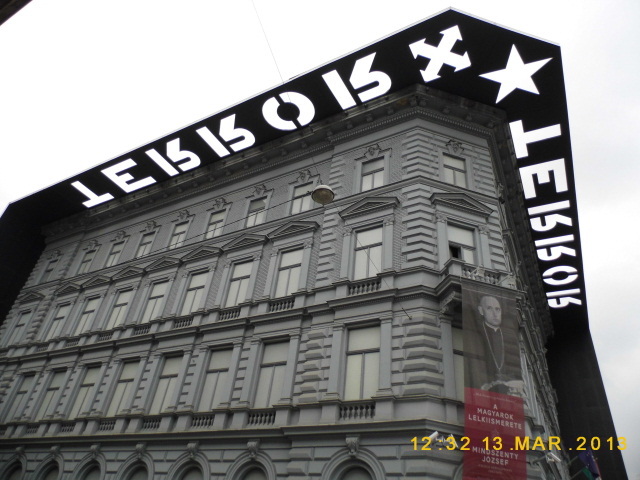 The one place we wanted to visit was the House of Terror. It is a museum that was once the headquarters of both the Hungarian Nazis and Communists. Before you enter the museum you see photos of the people who were executed during the period. It is a chilling place to visit. The fact that nobody said anything during the visit was enough for me. After a cup of coffee our spirits returned and we made our way towards Heroes’ Square. This was an impressive place to see. There were not many people there but I could imagine during the summer would be full of people. To the back of the square there is a small park, an ideal spot to have a picnic. 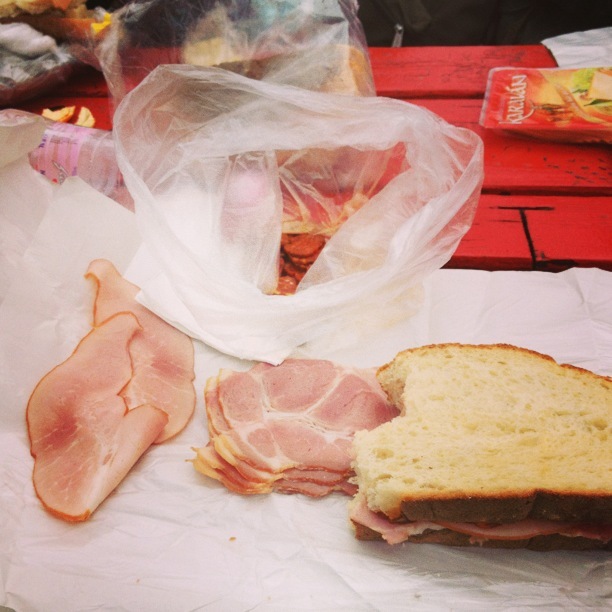 I had brought myself some smoked sausage, ham, pork and some fruit. It was good to relax. Eating al-fresco is something I could get used to. In the evening Marion and I said we would meet up with Ceylan later. We had gone to the Kiedo bar and restaurant for something to eat. It was full, that is always a good sign. We both chose Goulash soup followed by Duck Breast with Honey Mustard Gnocchi. I love it but Marion could not finish hers. As usual I washed it down with beer. We met up with Ceylan at the Instants Ruin Bar. An unusual place you could not enter until you had to pay to leave your coat in the cloakroom. Back home it is optional and you take it into the bar at your own risk. Ceylan brought along a friend she had met. I think his name was Alex. He was a good laugh. I enjoyed the night again. There was a little sadness in the air as it was Ceylan’s last night in Budapest. Tomorrow she leaves for Vienna. I hope she wakes up in time. I spent rather a comfortable first night in my hostel. I also enjoyed another filling breakfast. By the time I got ready for the day I had made up my mind on what I planned to do. When checking in I noticed the free walking tour. It is something I always take advantage of as a solo traveller it is a good way of meeting people. It was a beautiful day, a chance not to wear a coat. I made the slow walk towards the meeting point in Vörösmarty Square. As usual I arrived way too early. While waiting for the tour group to come together I was approached by a man who wanted to sell me a I-Phone. Noticing that he was holding the box I politely decline. I suspect there was nothing inside the box. As I registered myself with the group I met a couple of girls. One Brazilian, the other Canadian who were happening be studying in Brighton. We were getting along well. The tour started with a brief history of Hungary. With its recent poor record in choosing sides in 20th century wars I figure it has been unlucky. 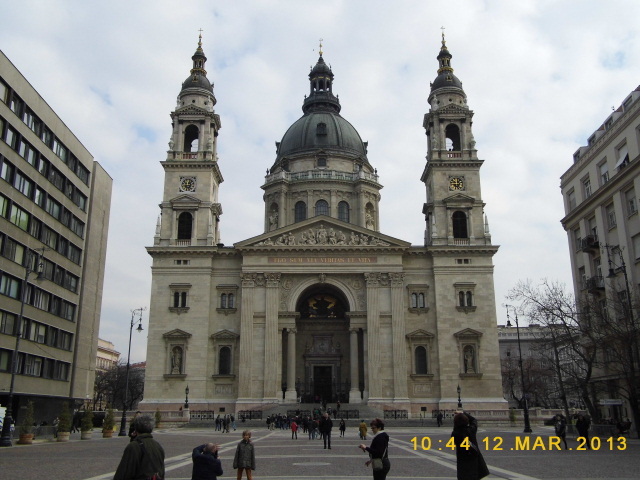 We started off in Pest passing St. Stephen Basilica before crossing Szechenyi Chain Bridge into Buda climbing Castle Hill towards the Royal Palace. The tour ended at the Mathias Church Fisherman’s Bastion. We were recommended a restaurant that we should try for some lunch. By this time several more people had joined us. Bree from San Francisco who was studying in Paris, Marion from Paris, Ceylan from Istanbul who is studying medicine in Poland and Martin from Poland. 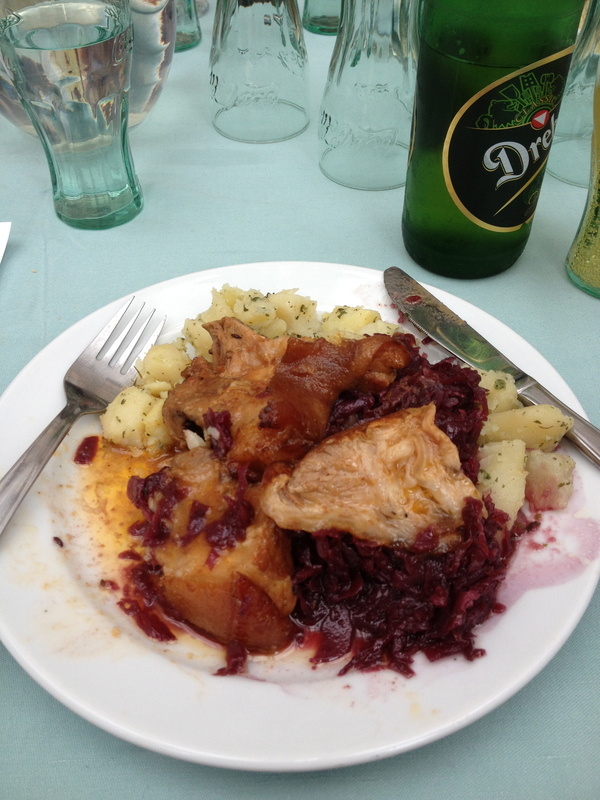 I chose a pork and potato dish with red cabbage washed down with a bottle of local beer. An enjoyable way to spend a couple of hours. After lunch we may our way to the National Gallery. Myself, Ceylan and Marion decided to go inside. Not before agreeing with everybody else that we should meet up later in the evening at the Szimpla Kert ruin bar. After leaving the National Gallery we made our way back towards Pest and our hostel. It was the slow route going first via the Parliament building. 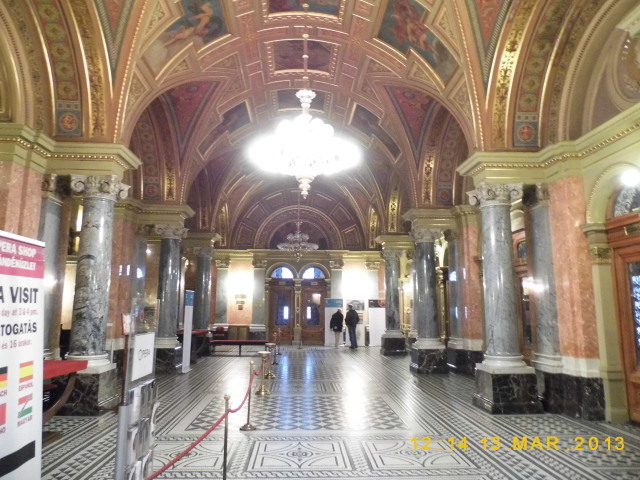 Marion commented that it looked like the Houses of Parliament in London. I had to agree. Carrying on further into the city I noticed a statue of Imre Nagy, the Prime Minister of Hungary during the 1956 Uprising. He is looking towards the Parliament building. It was a moving site to see. Going further we all agreed that we needed to drink coffee and ended up at the Hutte Cafe Bar. It was unusual that it was housed inside an inflatable building. Probably explains why the coffee was so expensive. After arriving back at the hostel we agreed that we should go for something to eat before going to the Szimpla Bar. We ended up in a restaurant called “Frici Papa”. 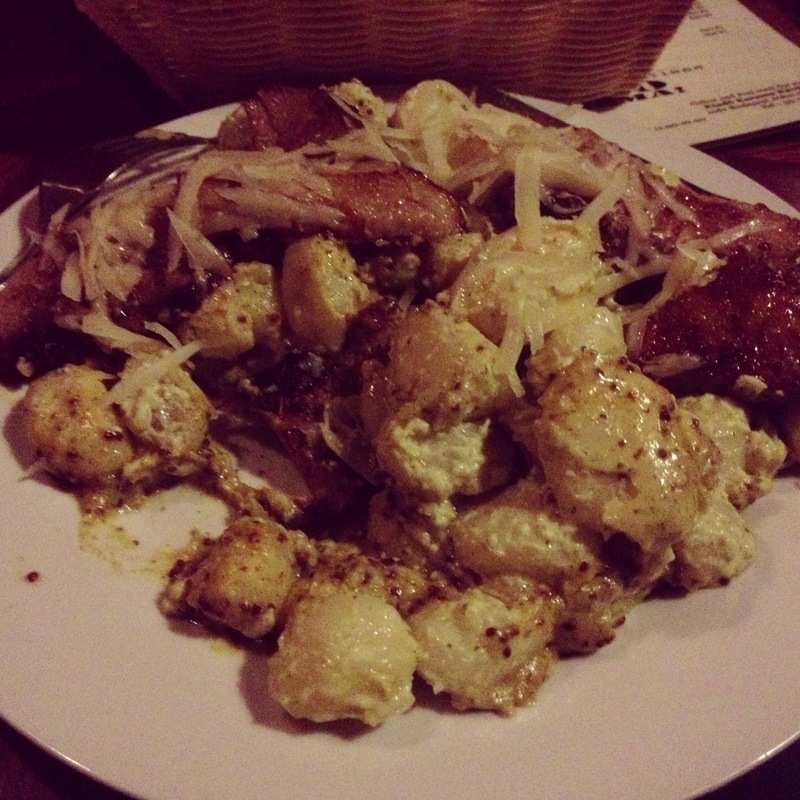 It served traditional Hungarian fare. I chose the Beef Goulash. When in Hungary as they say. After the meal we met up with everybody else at the Szimpla Bar. It is known as a ruin bar because it is housed in an old building that has seen better days. It is a bar containing different floors that played music or you could go to rooms to escape and chat. Martin met up with a friend he knew called Kasia a French girl and another person from Slovakia. It was a great evening even if I was starting to feel tired. It must be my old age. Ceylan and Marion agreed that we should all meet up for breakfast in the morning. My final day in Vienna and the batteries in my camera were starting to die. As it was a Sunday I noticed that no supermarkets were open. Being from the UK I found this unusual but I felt glad of this. It is important that people have rest from work. If the batteries give up I have the camera on my I-Phone as a backup. So I was not unduly worried. My clothes needed freshening up so before I ventured outside it was off to the laundry. This gave me the opportunity to decide where next to visit. 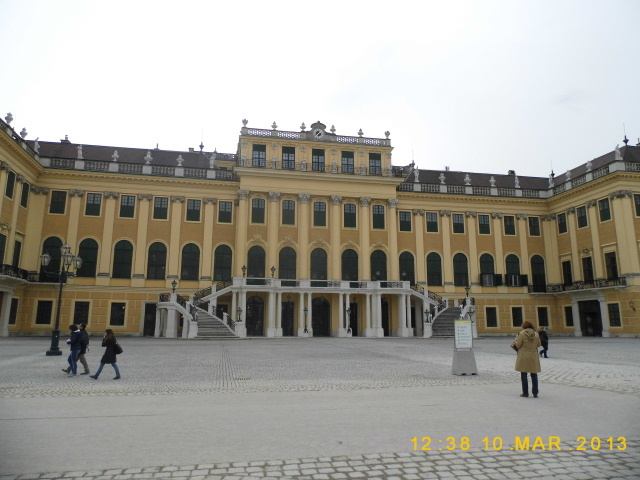 In the end I chose to visit the Schonbrunn Palace (Schloss Schonbrunn). According to Trip Advisor this is Austria’s most visited tourist attraction. 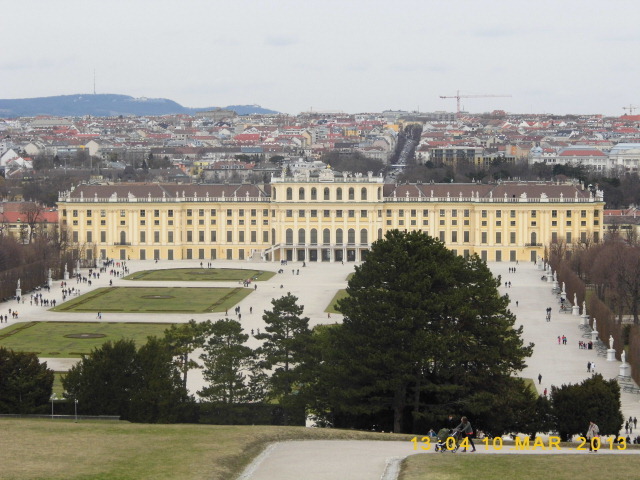 By the time I left the Schonbrunn U-Bahn station I could see why. There were a lot of coaches parked and people queuing to get inside. There appeared a lot of coach parties from Russia and Serbia. Once inside the palace grounds you see how magnificent it all looked. 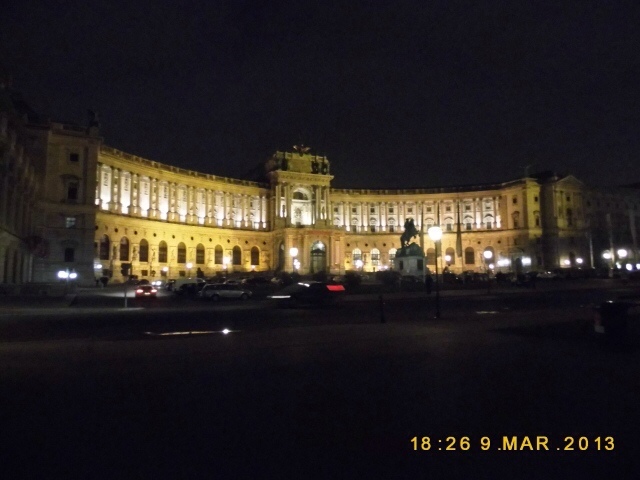 From the buildings to the gardens there is a majestic appearance that befits a royal palace. I started off inside the palace on the Grand Tour. 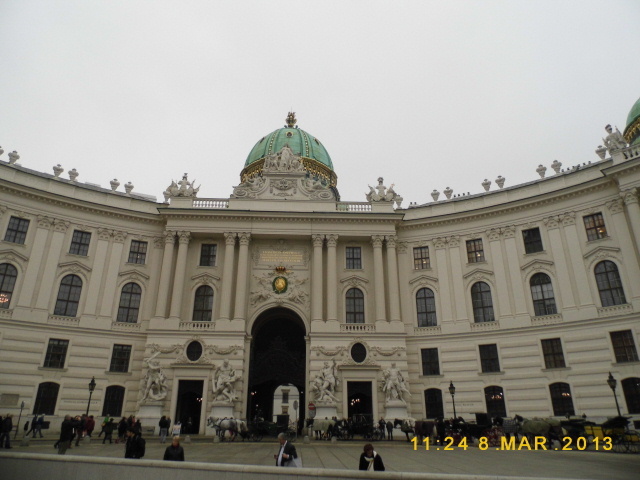 Like most museums in Vienna you are not allowed to take photographs. In fact you have to all your bags and coats in the cloakroom at no charge. You also get a free audio guide. The tour itself was alright however, I do feel that some of the information given did repeat from the Hofberg. After leaving the Palace I made my way towards the gardens and for me this was the highlight of the visit. There are a few paths to walk to reach the end of the garden but once at the top you are rewarded with an impressive view of the city of Vienna. This was the perfect opportunity for everybody to ask to take photos of each other using their camera. I must admit that I was nervous using better cameras than mine but everybody seemed happy with the results. One Japanese man was so impressed with my photography he asked me twice to take a photo. Making my way back down to the palace I walked through the woods. 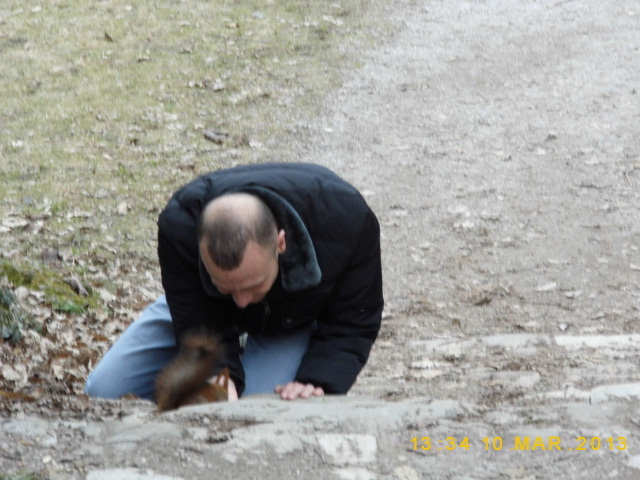 I had to stop while I saw this man feeding a squirrel. It was one of those moments where you had to stop and take a photo. By mid-afternoon I decided that I needed to leave and make my way towards the Voltsplatz and explore the area around parliament. Also I was feeling hungary and I wanted to eat a Bratwurst. In the end I just wanted to walk through the city centre back to my hostel. Tomorrow I leave for Budapest. It will be a new destination and I am looking forward to this. Another good nights rest was taken and another hearty breakfast had been eaten. I was ready to take on Vienna again. However, there was a slight setback. I had overspent yesterday and I needed to preserve my Euros. So I made the decision to visit landmarks that were going to be free of charge. First stop was the famous Naschmarkt. This is an institution in Vienna. A food market where you can literally eat the world. Another bonus point is the store holders who were on hand offering free samples so I could get fed as I was walking along. It is a big market and you can spend some time here. I noticed there was a hostel nearby. To have the ability to purchase and cook fresh produce daily. Being Saturday the Naschmarkt was also holding its weekly flea market. I can only say that some people have rubbish they wish to sell. A lot of it was broken yet the locals seemed intent on buying it. Each to their own as they say. One nice thing about the market was the amount of vinyl records that were being sold. Flicking through the covers took me back to my youth where every Saturday was spent in record shops. I often wonder if CD's had not been invented would we still have record stores. It was while walking when I spotted something that literally stopped me in my tracks. Amongst the LP's the elderly gentleman was selling was a copy of Gobbels greatest speeches. I had to take a photo to share but the gentleman looked at me wondering what was the big deal. Even though Germany invaded Austria in 1938 there were plenty of Austrians who were sympathetic to the Nazi values. Fortified by an excellent Vanilla Custard cake that cost one euro I made my way towards the Stadtpark. It has an almost English feel to it. It contains a golden statue of Johann Strauss. Just be vary of people trying to sell you tickets to concerts. 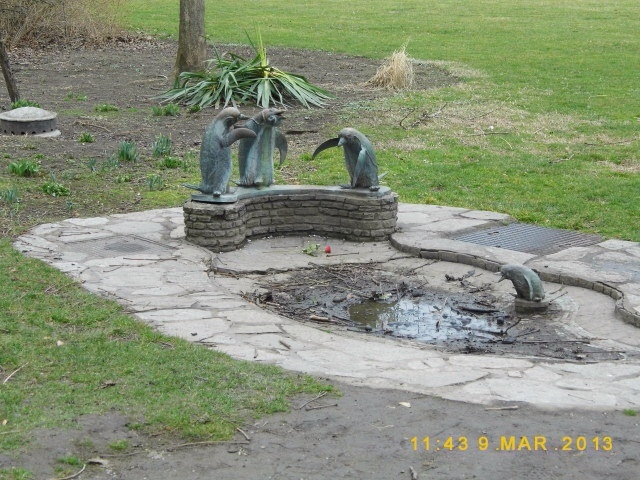 The park itself had plenty to see and photograph. After a quick cup of coffee my final destination of the day was the Zentralfriedhoff or Central Cemetery. An unusual choice you may argue but there are some famous people buried in there. It was a long walk from the U-bahn station Stringasse. I knew I was getting close as I noticed there were a lot of shops selling gravestones. How does one go about visiting a cemetery? After all it is a place of rest and reflection. It is Europe's second largest cemetery and is in use today. I could not get used to how large it was. As you walk you notice the gravestones. These were not individual graves but family plots that have lasted for generations. What I also noticed were how well looked after the graves were. I could see families taking as much care as if it was their own homes. It was touching to see. Also moving were the number of graves were one partner was buried whiles both names were carved on the gravestone. You reach the main building where there is a map showing where the famous are buried. The highlight of the visit would be the grave of Beethoven and the memorial to Mozart. He is not buried in the cemetery. 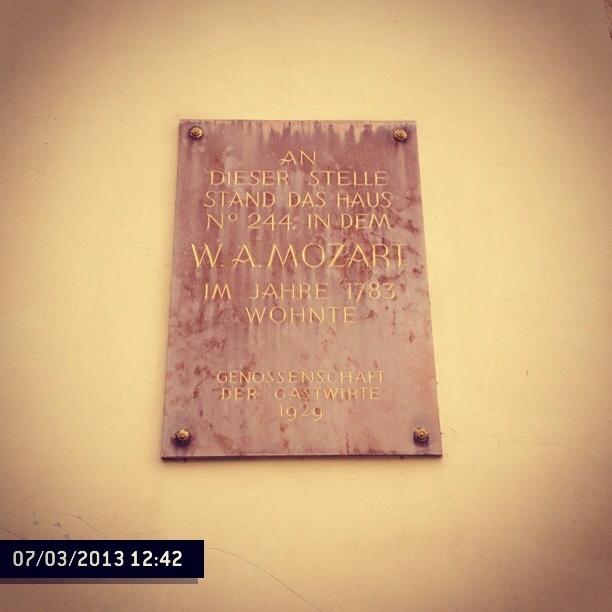 When Mozart died he was buried in a pauper's grave. I also found the graves of Brahms, Joe Zawinul and Curt Jurgens. The only grave I could not find was 80's popstar Falco. Visiting the cemetery gave me time to reflect. We will all end up in that state one day. So it is best that we make the most of life while we can. From the cemetery I made my way back to the Naschmarkt. Maybe there was a store open to get some food. By the time I had arrived there stores were closing so I made my way towards the city centre. 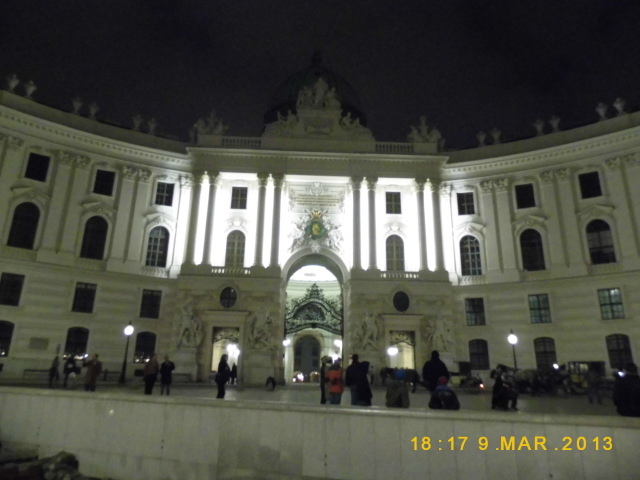 This is my second visit to Vienna but I had yet to see it at night time. I was simply bowled over by the sights. Again I was snapping away. Being out at nighttime allowed me to try a Currywurst. This was not wrapped in a bun but sliced up and served on a plate with a bread roll. It still tasted delicious. With my feet starting to feel like they could no longer take another step I made my way back to the hostel. Not before stopping off to purchase an ice cream. Yes, chocolate and caramel cone. The weather was cold but the temptation was there and I succumbed. This was an enjoyable day where I proved that you do not need to have money to have a good time. That was a good night's sleep. Sometimes it is good just to unwind and relax. The all you can eat breakfast is a great way to start the day. In my own mind I know what I want to do today. The thing is not to rush about and try to fit everything in one day but go at a pace I can enjoy. Anything I miss I can always catch up at a later date. 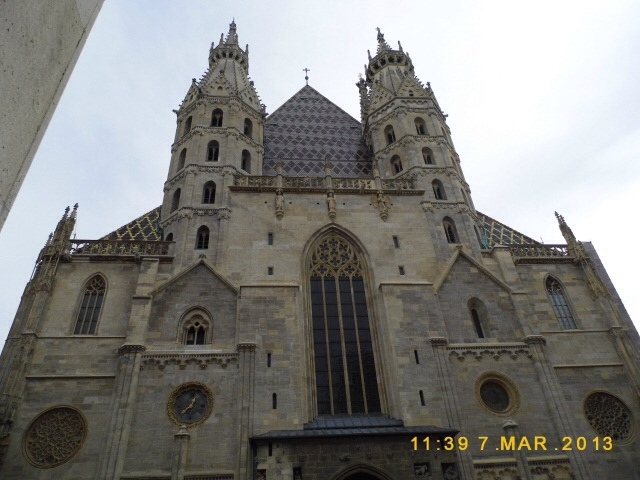 First stop after purchasing my Vienna Card is St. Stephen's Cathedral. This time I am going inside. It is a spectacular building. Initially I walked around the outside section clicking away on the camera like it was going out of fashion. I do admit to clicking too much when it comes to photography. I decided that I might as well pay the full admission fee. This will give me access to the Catacombs and entrance to the North and South Tower. 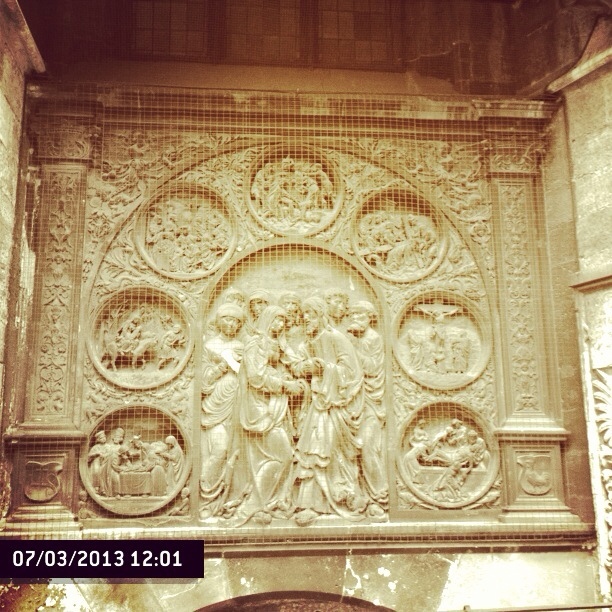 I took the self guided tour with audio guide. I followed the map and everything seemed to be going well until I reached the chapel. As I was about to look inside I was I informed that it was about to close. A christening was about to take place. Obviously, there are some well heeled families in Vienna. So I moved on to complete the rest of the tour. When I returned my audio guide back to the counter I was told if I was quick I would make the tour of the Catacombs. I was waiting for the tour to start. However, the guide was trying his best to persuade a homeless woman that she should not be sleeping in the cathedral. She was trying her best to ignore him. So eventually we set off on the tour. There was no photography allowed so I can only describe to you what I saw. First off we were shown the final resting places of the Archbishop's of Vienna. Then we were taken to see the coffins of old Emperors. Bizarrely there were numbered containers on shelves. 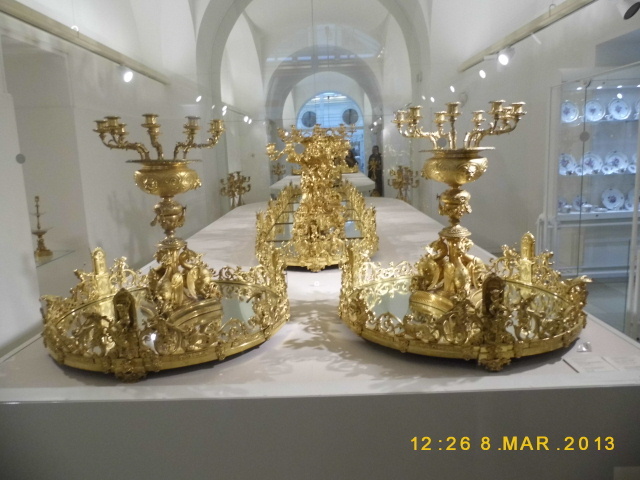 Each container held the internal organs of the Austrian Royal Family. The organs were preserved in vinegar. We were taken further below the cathedral. It began to feel cold and damp. The guide said this was down to the recent snowfall in the city. We were shown rooms where the bones were stacked on top of one another. There were rooms where bones appeared scattered everywhere. Then like that the tour was over and I made my way back to the cathedral. To my horror everything was closed as a service was being conducted. I asked the attendant if I could come back later to use the rest of my ticket. He said yes so it was off to the Hofberg. From the outside the white building was a perfect photo opportunity. It is a beautiful structure. 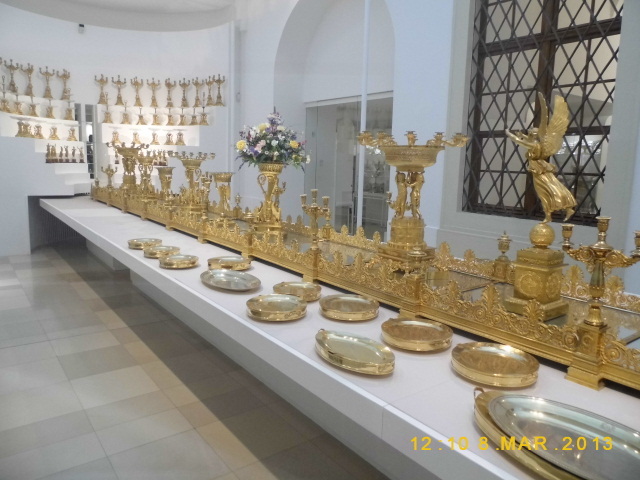 Using my Vienna Card to get a discount I first entered the building to see the Silver Collection. 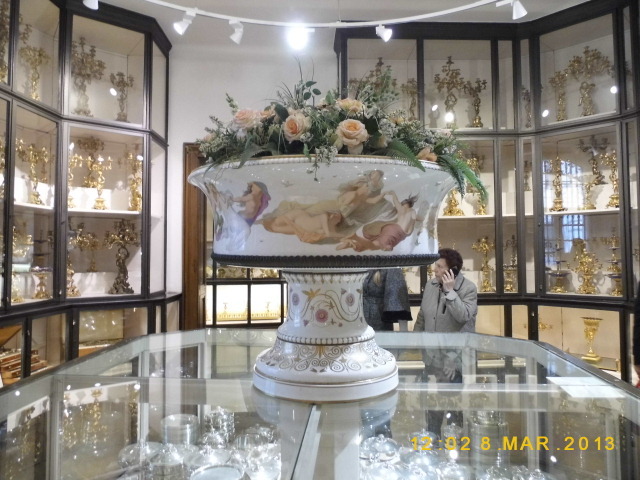 It is not just about silver, there are displays of porcelain tableware as well. I came away with the impression that some people had more money then they knew what to do with. Next stop was the Sisi Museum. I found this place to be interesting. Empress Elizabeth (Sisi) is held in great affection. This affection came after her assassination. What is interesting was that during her lifetime she was disliked for the way she treated her husband the Emperor Franz Josef. My impression was that she was a vain and self-centred woman. I could not but compare her to Princess Diana. 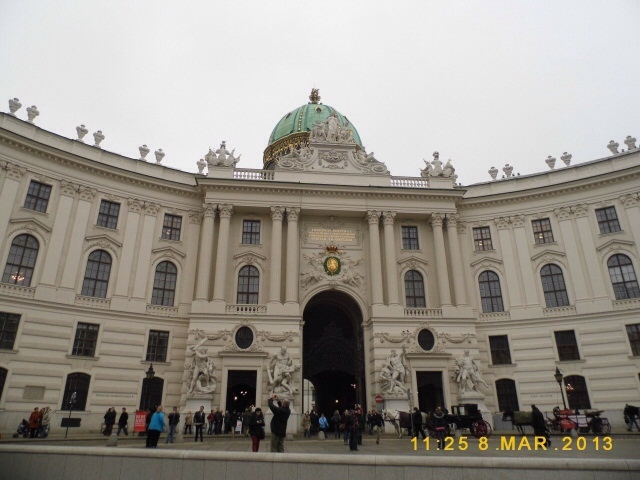 The final part of the tour was the official apartments belonging to the Emperor and Empress. What was pleasing about the whole Hofberg experience was the free audio guide. It helped with the whole visit. 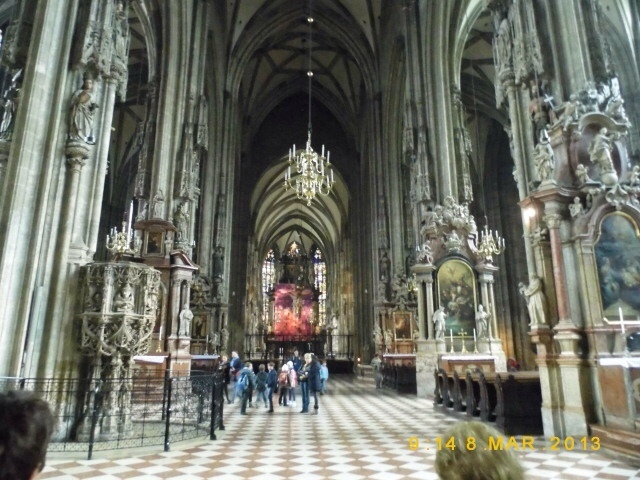 I thought I would then make my way back to St. Stephens Cathedral to use the rest of my ticket. Again it was closed for a service. Somethings were not meant to be. Feeling worn out I thought it would be best that I cook myself something to eat tonight. Chicken Wraps should do the trick. I just felt that I may have cooked too much. I had managed to get some quality sleep. The neck rest my sister brought me for Christmas had come in useful. As dawn broke I could see the wonders of Austria. As the sun rose it shone on the snow on the mountains. It was beautiful. Sadly, I was not awake enough to think about taking photos. The pulled into Vienna coach station just over an hour late. I was not bothered to be honest as I was just happy to arrive. The coach station in Vienna is not in the most fashionable part of the city. 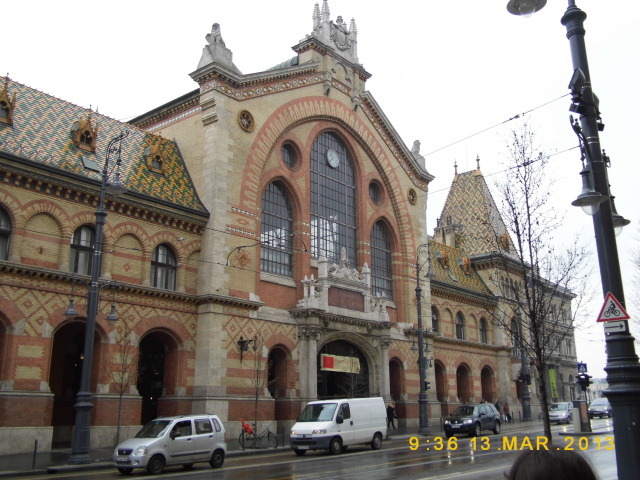 As I had been here before I knew where I was going so it was off to the U-bahn station. Took the train to my destination. When I arrived I ended up leaving the station at the wrong exit. The last thing I needed to be dong was wandering around like a lost soul. Suddenly I found my bearings and it was off to the hostel. When I arrived at the hostel, the staff could not have been more helpful. While I could not check-in until 2pm they said I could have breakfast and relax in the lounge. It was too good an opportunity to turn down. It gave me a chance to catch up on answering some e-mails and re-charge the batteries. At around midday I was starting to feel sleepy so I took the decision to go out for a walk. The weather was good with the sun shining so I made my way towards the station and towards Stephansplatz. You might have been aware that I had purchased myself a new camera. There had been little opportunity to use it until now. I was snapping away like it was going out of fashion. I am not too sure how many of the photos will turn out right but I felt more confident with it. I will post the results in future posts. Promise you will not laugh. These photos were taken by the iPhone. After three hours I knew that I needed to get back to the hostel so I could check-in and rest. Check-in went smoothly enough and soon I found my way to the room. As usual I always seem to get the top bunk. I must have it tattooed on my forehead. I did not mind as the bed felt comfortable so I should get some sleep. I hope that my snoring will not keep everybody awake. After a quick nap I felt hungry but did not want to cook for myself. Nor did I want to go too far. After a quick walk I found myself a well known chicken outlet and that satisfied my hunger for the night. Finally I cashed my free drink voucher, looked at more emails before settling down for the night. Man, I needed my bed. 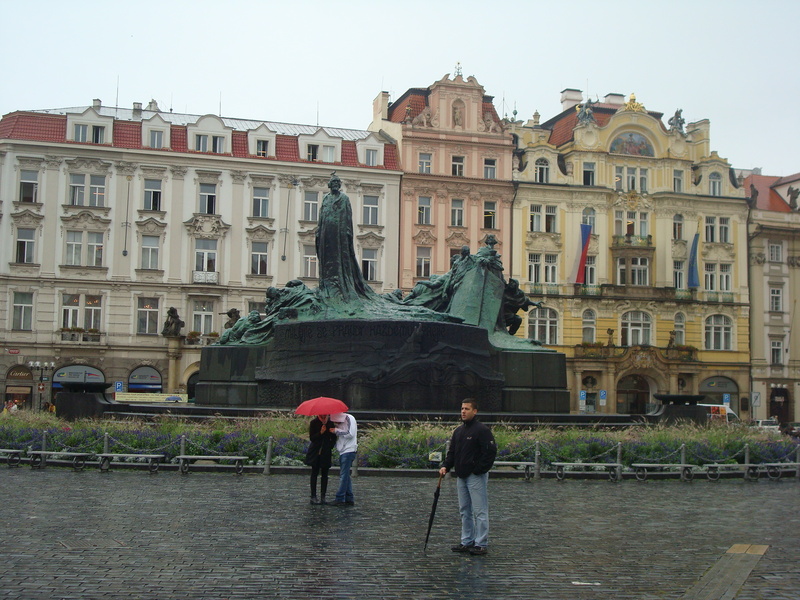 Since I returned Prague in September I have been giving a lot thought to my travel plans for 2013. Sadly I am not in a position where travelling on a full-time basis is an option. It is a case of balancing travel with work. Also because of finances I have decided to stick to Europe next year. Do not worry the rest of the world, your time will come. I may have already mentioned in a previous post that my first trip will be to Vienna and Budapest in March, In total it will last twelve days including the travel time. I will be using Eurolines coach service from London. The reasons for choosing these cities were clear. 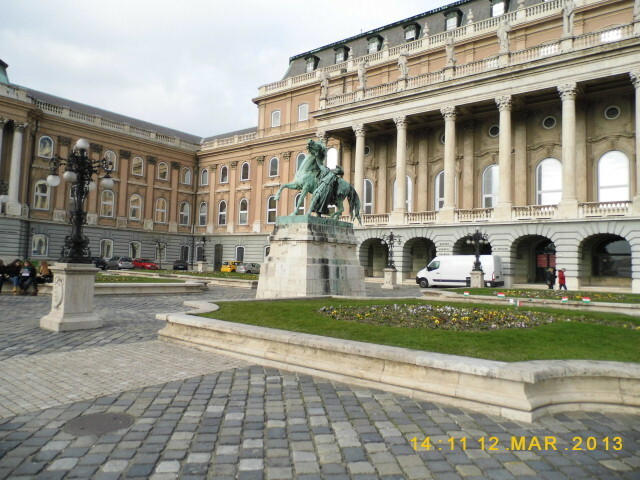 I was in Vienna in 2011 but was confined to my dorm with food poisoning so I missed out on the delights of the city. Second time lucky I hope. 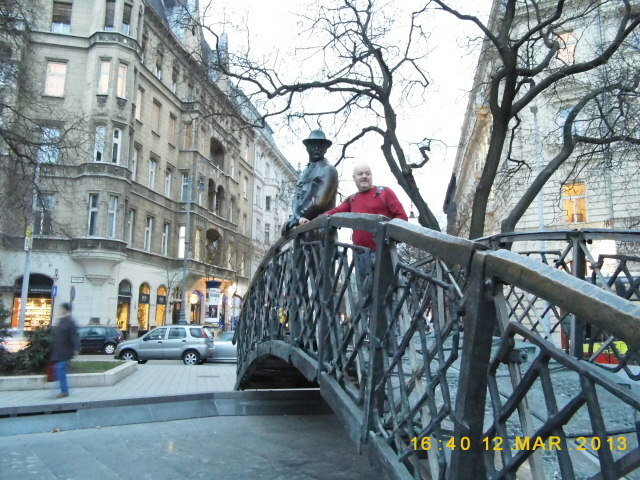 I felt on my last trip to Prague and Bratislava that I could have planned the trip better and allowed time to visit Budapest. I am particularly looking forward to visit as I had heard good things about the city. My second trip I am really excited about. I had mentioned that I was looking to do a loop of the Balkans. The only thing that could hold me back would be the amount of time work would allow me to take off. On Tuesday I was given the good news that I could take three weeks off work. Now I can start planning for the Balkans in September. All I know at this moment is that the tour will start and finish in Zagreb. Which direction I take will be down to logistics. I am looking to take in the major cities in Serbia, Kosovo, Albania, FYR Macedonia, Montenegro, Bosnia Herzegovina and Croatia. Also 2013 will see me travelling more in the UK. Also I will be looking at the feasibility of planning a big trip where I would need to take a prolonged break from work. This has always been a dream of mine. At the least I should explore this. With my plans looking clearer I cannot wait for 2013. Until the next time stay safe, stay healthy and keep smiling. After Prague I thought that things would not get any better. Therefore I was totally and pleasantly surprised what I found in Bratislava. The city itself displays plenty of history yet it is small enough to be able to be explored by foot. Initially when I arrived into Bratislava I was left feeling disappointed. It was Sunday afternoon and when I stepped out of the bus station it was though I was transported back to the 1970s and communism. The trolley bus looked rickety and dated. Having said that it did take me to the stop nearest the hostel. After being advised by the hostel to take the free walking tour it was then I discovered the delights of Bratislava. There is a lot of history in Bratislava but there is also a lot to see that made me smile. The city does not take itself too seriously. 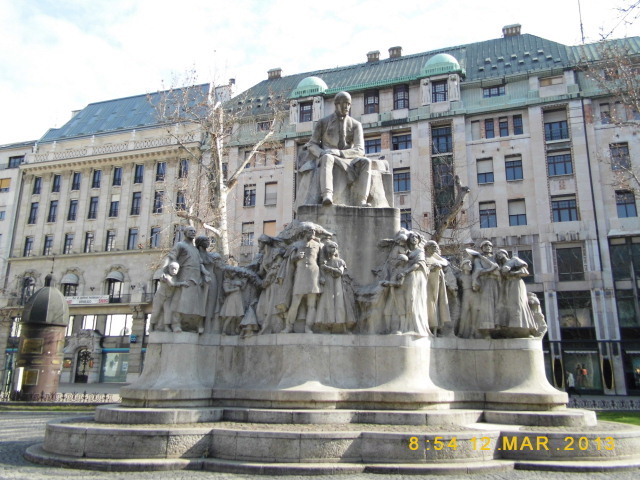 Bratislava was a major city of the Austro-Hungarian empire. 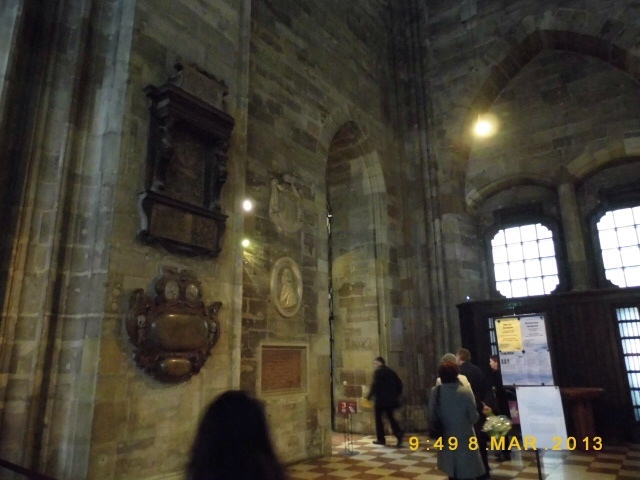 At one point the Emperors were crowned in St. Martin’s Cathedral. A lot of the old city was demolished during the 1970’s to allow for a flyover. One could only think how much more beautiful the city would look. There are a lot of colours with Bratislava whether it is the bright blue of the St. Elisabeth’s Church or the greens and yellows. This is something that town planners in the UK should consider. A splash of colour is a great way of brightening a place. I suspect that it would not cost too much either. It is also a city that does not take itself too seriously. There are indicators of this with some of the statues you find dotted around the city centre. Being so compact Bratislava offers the cafe culture that I loved. Plenty of bars, cafe’s and coffee shops to enjoy. It allows you to watch the world pass by. It has that kind of vibe. This is an ideal city for a long weekend. Spend the first day exploring the city centre. The next day I would go and see the spectacular ruins of Devin Castle. Spend the afternoon cycling in the surrounding countryside that hugs the Danube river. It is only a thirty minute bus ride from Bratislava. I would also include a trip to Shtoor Home Made Cafe. A perfect place for good coffee, sandwiches and excellent cake. What more can a man want from life. To sum up Bratislava I would say that it is one of Europe’s secrets. How long it will stay like this I would not like to say. Whatever happens it will always have a small city feel that I love. I cannot wait to go back. What can I say about the city of Prague. It is beautiful, historic, full of fun and crowded. It was always a city that I wanted to visit for a long time. 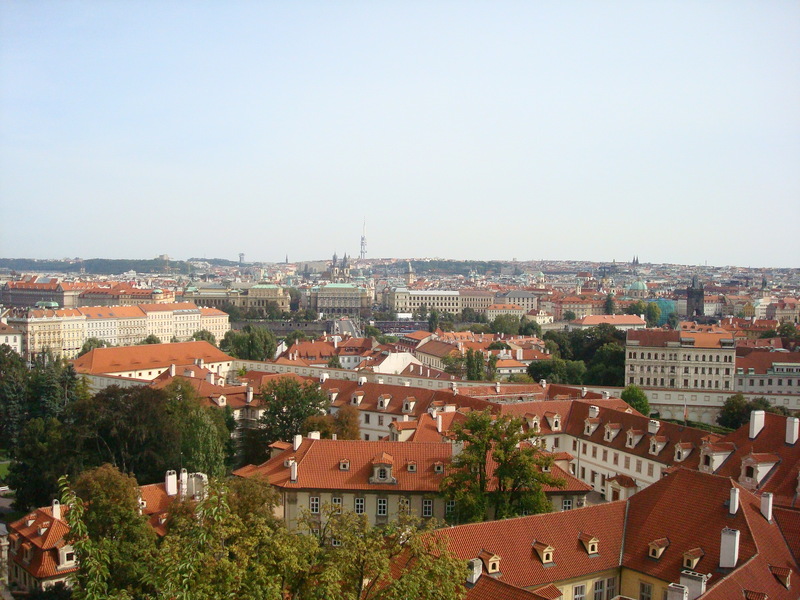 Twenty three years since the full of Communism would Prague fail to live up to expectations. The answer was that I fell in love with the city. There is something for everybody be it culture vulture or party animal. Everything in Prague is compact and easy to reach by foot. However, I recommend that you start your day early if wish to avoid the crowds particularly if you are looking to cross the Charles Bridge. 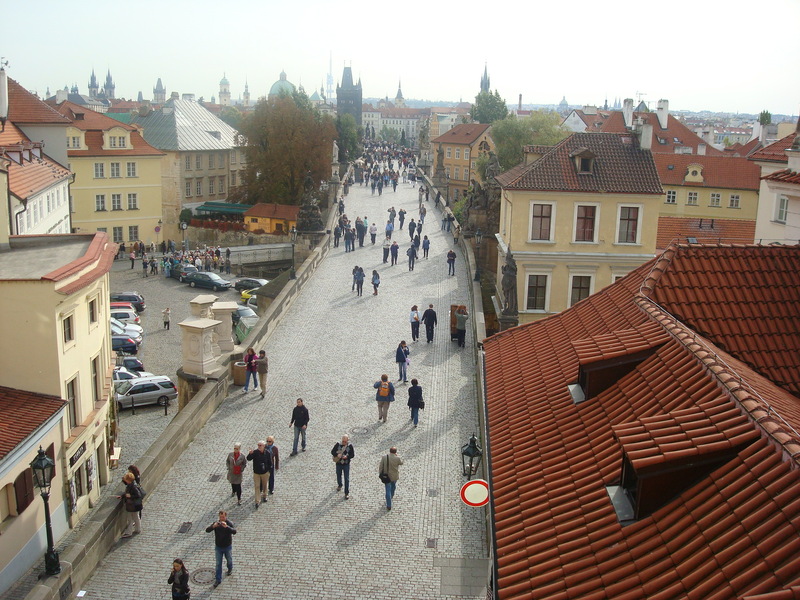 I was in Prague during September and there were a lot of visitors. Suffice to say it would be best to avoid Prague during July and August. The best way of gaining your bearings is to go on a walking tour. Once you see the landmarks it is easy to remember where you are going. Plenty of companies organise walking tours. I was lucky the my hostel operated a free one. As a solo traveller I found it a great way of meeting people. 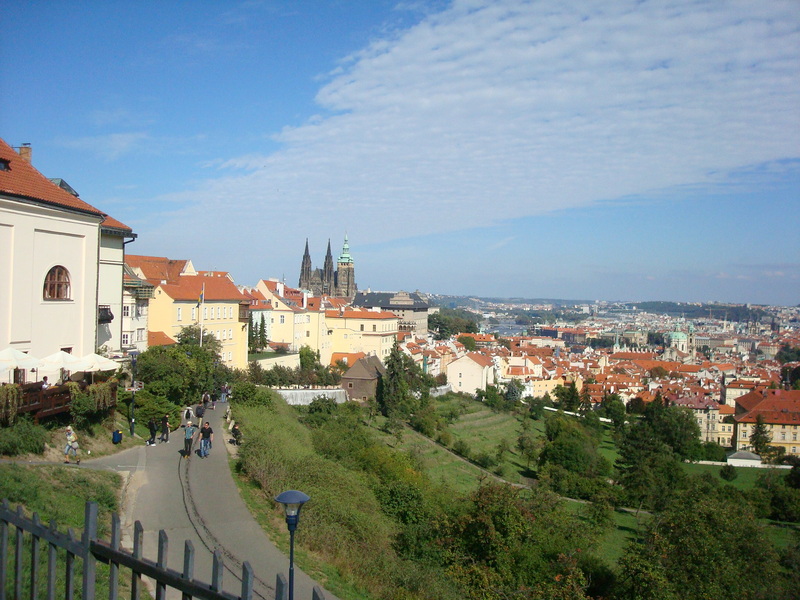 Walking is not the only way of seeing Prague. There were carriage tour and even a Segway tour too. All of these attractions can be visited in a day, something I managed to achieve. Admittedly it meant crossing the Charles Bridge at 09:30. As I mentioned earlier Prague has a reputation of being a party town. Starting with organised pub crawl from the hostel I explored the bars and clubs the city had to offer. What I liked about the nightlife in Prague was how relaxed they were about the house rules concerning attire. I was wearing casual clothes with black training shoes and had no problem in gaining entrance. This is so different to the UK. I ended up at Karlovy Lazne (5 Story Club) apparently Europe’s tallest nightclub. A tip is the further you climb the cheesier the music becomes. This is pleasing for an old fart like me. Then there is always the beer. It is true that it is cheaper than buying soft drinks. However, the reputation of beer’s quality is such that it represents real value for money. There was a bar on spirits over 20% proof while I was in Prague. This was due to poisoned alcohol being sold in the street which had claimed lives. There are plenty of small bars that sell absinthe the strong aniseed flavoured spirit. If that sounds too much for you then you can try the absinthe flavoured ice cream. I was made extremely welcome in Prague. It is a safe city to walk around. Whatever you choose to do I am sure that you will have a good time.